Driving with one hand one the wheel while the other is used to hold a cellphone is a big no-no, as it distracts you greatly from your task, and this is where the Nexus Drive Solar Pro is here to help – it is a Bluetooth solar-powered speakerphone that not only lets you keep both hands on the wheel, it also allows you to carry out a conversation over the cellphone legally. The Bluetooth Car Kit comprises a sleek black car speakerphone that mounts to your car’s windscreen via suction cups and ensures you stay safe and legal when driving, without ever missing an important phone call. The Bluetooth Car Kit comes with a variety of charging options, including USB and via your car’s cigarette lighter, but the most notable is the powerful built-in solar panel. 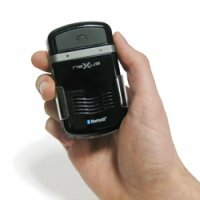 Just two hours in daylight provides one hour of talk time, which is largely thanks to this environmentally-friendly car speakerphone using less energy than standard devices. With your phonebook transferred to your car speakerphone you can also make use of the handy Text-to-Speech feature which speaks the name/number of any incoming calls so there’s no need to take your eyes off the road. Save energy and talk for longer with the Bluetooth solar powered speakerphone! This nifty little green device will cost you £44.95 – we love the fact that there is no need to worry about whether the batteries are charged or not before we head out for our destination since the good old sun will do its part in keeping this juiced up.